← 405 "Treehouse of Horror XVIII"
"Little Orphan Millie" is the sixth episode of season 19. It originally aired on November 11, 2007 and was written by Mick Kelly and Directed by Lance Kramer. "When Kirk and Luann remarry and go on a honeymoon cruise, they topple off the boat into the sea and are presumed dead. Milhouse turns into a real man following the death of his parents - making him more popular than ever. Bart contacts Milhouse's uncle in a bid to regain his popularity, only to realise how much he loves his friend when he plans on leaving. Meanwhile, Homer finds himself in trouble when he can't remember Marge's eye color." The Simpsons and Van Houten family are at a picnic, where an identically-dressed Kirk and Luann claim they have an announcement to make. Much to the adoration of the party, Kirk and Luann announce they are to be re-married. At the Simpsons home, Homer and Marge are getting ready to go to the wedding. After a casual remark from Homer, Marge is shocked to find Homer truly does not know the color of her eyes. Until Homer remembers, Marge makes a solemn vow not to let Homer see her eyes until he knows their color; causing an uncoordinated Marge to cover her eyes. While the Van Houtens are on their honeymoon, Milhouse stays over at the Simpsons, proud and happy his parents are back together. While on the boat Kirk carries Luann down the hallway to their private room, though the boat begins swinging from side to side, so violently that the two fall off the boat. 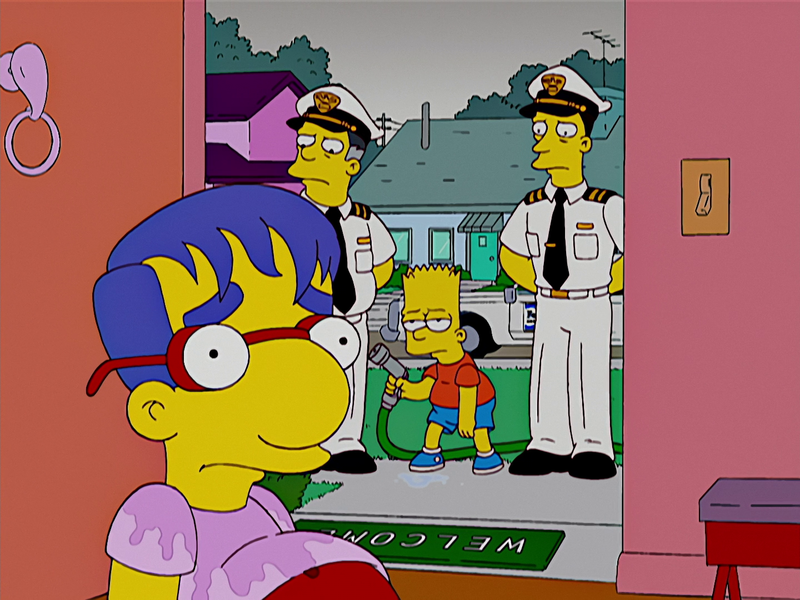 When inside the Simpson house, Milhouse goes to answer the door. Two coastguard members sadly inform him that Kirk and Luann are lost at sea, and possibly dead. Milhouse soon becomes depressed and truly convinced his parents are dead. Though Marge invites Milhouse to stay for as much as he likes, Milhouse replies to everything with more depression, especially after another coastguard member arrives to blatantly tell him they cut the search off early. Finally, after sucking upon Maggie's bottle, he discovers he truly is the "world's oldest baby", and promises himself that he will soon become a true man. Meanwhile, Homer continues making fruitless attempts at looking for traces of hints that can help him discover the color of Marge's eye including photos. He soon finds out there are not any photos of Marge in the house besides their wedding album. After failing to open it, he discovers there is a lock. When asking Marge for the password to the combination, she tells him it is their anniversary, though he forgets that also. At school, Martin points out a mysterious figure in the shadow of a large oak tree, though when closely scanned, it is revealed to be Milhouse. Coming out of the shadows, Milhouse's new behavior and attitude (gloomy, mellow, and poetic) grabs the attention of the girls at school, including Lisa. Nelson refuses to punch Milhouse as he feels there is no longer any point. Finally, it is shown Milhouse is usurping Bart's popularity. At lunch, a lonely Bart sits by himself at a table, where Ralph Wiggum even tells him he's "embarrassing himself". When leaving the school bus, Sherri begins flirting with Milhouse, causing a desperate Bart to try Krumping. After no one laughs at him, a miserable Bart heads up to his room, ignoring Marge's invite to continue Krumping with her. In his room, Bart is reading the "Daily Fourth Gradian", showing in the popularity scale, Bart is steadily decreasing. After concluding that Milhouse with family would be happy again he remembers that Milhouse gets Danish butter cookies every Christmas from Solvang, California. He decides to connect Milhouse with his Danish Uncle Norbert van Houten. Waiting at the airport, Uncle Norbert, arrives by his own biplane, and asks to be referred to as "Zack", the proud Danish van Houten with a hatred towards the Dutch van Houten. After Zack arrives to get Milhouse from the school, Milhouse tells Uncle Zack that he doesn't need him prompting Zack to say, "I see you've shed you Dutch ways and become a true Dane." Milhouse's popularity escalates even higher. Homer continues to search for the color of Marge's eyes and when Abe notices his desperation, he reminds Homer of a song he sung to Marge during the early strands of their relationship. After remembering a portion of the song contained Marge's eye color, Homer begins to sing out loud in the air, though when he does not remember the last word (being Marge's eye color) Homer begins to give up, until Marge, who is standing at the door, remembers the song and proudly removes her sun glasses, revealing a bright, beautiful hazel shade to her eyes, concluding Homer's song of "a beautiful, deep shade of hazel". An angry Bart soon discovers Milhouse plans to fly away in a hot air balloon with Zack. After convincing from Lisa, Bart realizes that he loves and thus will miss Milhouse. Milhouse, Zack, and Bart take off in the hot air balloon and come upon an island, where a very much alive Kirk and Luann plan escaping with a nature-made hang-glider. After flying, Kirk and Luann's hang-glider cuts the hot air balloon and soon, Milhouse re-unites with his parents. Zack states that he has already called for help and then gets into a fight with Kirk over their heritage (Danish and Dutch respectively). The episode originally garnered 10.57 million viewers on its first run, that being the third highest of the season so far. Robert Canning of IGN enjoyed the episode, quoting the episode begin brilliantly but ended up going downhill. He enjoyed the beginning scene where Homer unintentially mocks Marge with the beehive. Though he quotes the first act was enjoyable, he enjoyed the second act where Homer repeatedly puts his foot in his mouth when mentioning Milhouse's parents. He hadn't enjoyed the subplot that centered on Marge's anger over Homer's inability to remember the color of her eyes, as he describes it as the clear definition of a "filler". He felt it was a let down, particularly the musical number revealing "hazel". He quotes, overall, "Little Orphan Millie" was a middle-of-the-road episode that will never really stand out. Modified on July 2, 2018, at 14:07.